On average, golf carts cost around $5,000. Used golf carts for sale can cost even less. Many dealerships offer financing options similar to car dealerships. In comparison to a new car, this is a small price to pay for a reliable form of transportation. Golf carts also take a lot less energy to operate. Whether you choose a gas-powered cart or battery, the relative light weight will allow to operate your vehicle at a much lower cost than a regular car. If you are someone that lives near a golf course and frequently plays golf, owning your own cart can help you save thousands of dollars per year in cart fees. 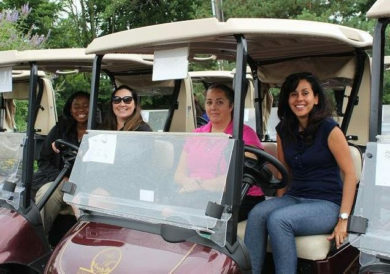 Other than actually playing golf, golf carts are great for a variety of activities. For example, going on outdoor adventures. With the right tires and lift, golf carts have the capability to get through rough paths like any other kind of all-terrain vehicle. Alternatively, golf cats can be made street-legal to allow you to drive your cart on paved roads. People that live on large properties, or gated communities, love to own golf carts because of how much easier and affordable it is to get around! Golf carts are great vehicles to use while working too. Whether you are doing chores around your property or have a job that requires you to move around frequently, carts can be great assets to help you work efficiently. Golf carts are a fun way to have a fun time. Many families love going on golf carts rides as a way to enjoy their time together and enjoy the outdoors. There are golf carts available that comfortably ride 2, 4 or 6 passengers. The ease of maneuverability allows elderly people, or other people who cannot drive automobiles safely, a chance to drive a motorized vehicle safely. The options are endless when it comes to making a golf cart fit your style! Features like lift kits, custom seats, special tires and Bluetooth speakers can take your cart to the next level! Paint it your favorite color to make it an easily recognizable vehicle that stands out in a crowd. Speaking of custom golf cart crowds, many golf cart friendly communities hold annual golf cart parades in which prizes are awarded the most creatively designed vehicle. Customizing your golf cart is a fun way to express yourself without polarizing your everyday vehicle. 5. They are easy to keep up with. Golf carts require very little maintenance, so they are not stressful to maintain. Compared to a regular vehicle, they do not constant checkups like regular cars do. As long as you ride them with care and service your golf cart regularly, it is likely you will have very few instances of your golf cart malfunctioning. In fact, because golf carts are easy to maintain, they often come with an impressive re-sell value given they are in good condition.